Born in 1911 in Russelheim, Germany, the son of a Lutheran pastor. Raised in a very religiously strict home, with fervent anti-Nazi overtones. Educated at the University of Leipzig, he was an organizer of the German Socialist Party. 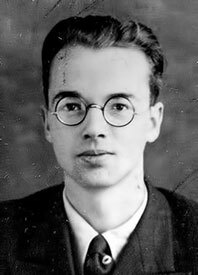 Joined the Communist Party as a student at the University of Kiel but fled to England when Adolph Hitler attained power in September 1933. Obtained a Ph.D. from the University of Bristol in 1936 and followed that up with a Sc.D. from the University of Edinburgh. Attempted to become a British citizen in 1939, but England entered World War II against Germany and Fuchs was arrested as a suspected German agent (which he was not). Was sent to an internment camp in Canada. Became extremely angry and resentful of his treatment by the British and was likely contacted by Soviet agents during this time. Was released from the internment camp based in part on his noted anti-Nazi statements. Based on his background and capabilities in physics, was recruited back to England to work on the joint effort between England and the United States to create the atomic bomb. After obtaining security clearance, worked with Professor Rudolf Peierlson an endeavor called the Tube Alloys Project. While working on this atomic research, he also became a British citizen. Although working on the atomic bomb research project for Britain, developed a moral dilemma in that he felt the Soviet Union should have access to the same research, being an Ally with Britain and the United States. Developed a contact with the Soviet Embassy in London and agreed to pass along information. Began by delivering copies of monthly reports to his contact, Semion Kremer. Was sent by Britain to the United States to work further on the atomic research project in late 1943 at Columbia University. Met with a new Soviet contact in the United States named Harry Gold (known to Fuchs as Raymond). Delivered research notes to Gold each month, while in New York and later after being transferred to the Los Alamos laboratories in New Mexico where actual development of the bomb took place. Stepped up the meetings with Gold, delivering information each week to him. Delivered technical schematics of the atomic bomb as well as reports on test blasts. Also delivered information about an experimental plutonium bomb. Ended his meetings with Gold after the United States dropped atomic bombs on Hiroshima and Nagasaki. After returning to England in 1946, served as the head of the theoretical physics division of the Atomic Energy Establishment in Harwell. England was in the process of developing its own atomic weapon and wanted Fuchs contributing to the effort. Continued to supply the Soviet embassy with documents and information, keeping them abreast of British innovations, despite the fact that World War II had ended. Was assigned a new contact in Britain, code-named “Sonia.” Sonia was in fact Ruth Kuczynski, a very successful Soviet spy throughout Europe. Sonia proved to be a difficult taskmaster, more and more demanding of Fuchs for information. Fuchs became disenchanted with Soviet requests, believing that their use of the information was nowhere nears as noble as he had envisioned. Eventually severed contact with Sonia any Soviet agents. In 1949, the FBI uncovered information detailing the actions of a scientist working on the Los Alamos project, active in disseminating classified information to foreign agents. 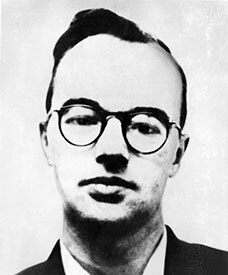 The scientist, code-named “ChARL’Z” was determined to be Fuchs, The FBI informed British Intelligence liaison Kim Philby (himself a member of the notorious Cambridge spy ring). Philby, afraid of exposing his own espionage activities, passed the information along to British authorities, but lacking hard evidence, Britain was unable to arrest Fuchs. Ignorant of the investigation centered on him, Fuchs approached a Harwell security officer to inquire as to concerns regarding his father’s recent appointment at the University of Leipzig in Soviet-controlled East Germany. MI5 sent William Skardon, one of their top interrogators to interview him. Under friendly questioning, Fuchs broke down and confessed on January 27, 1950. In his confession, Fuchs implicated several spies, including Harry Gold. Exposing Gold in turn exposed David Greenglass, which in turn, exposed Julius Rosenberg and his wife Ethel. Tried for violating the Official Secrets Act, Fuchs tried to explain his actions by claiming a “controlled schizophrenia” which allowed him to value the Marxist philosophy and passing secrets to the Soviets while at the same time holding a loyalty to England. The court was unimpressed and sentenced Fuchs to 14 years in prison. Sent to the Wormwood Scrubs prison where he served as the prison librarian. Was released in 1959 after serving as a model prisoner. Moved to East Germany and headed the Central Institute for Nuclear Physics in Dresden. Married Greta Keilson and lived in relative anonymity until his death, by natural causes, in 1988.